Structures the raw material associated with the problem statement. Helps to retain, organize, and evaluate assertions, ideas, and concepts for your research proposals, research papers, term papers, college essays, Master's thesis, Ph.D. dissertation, etc. 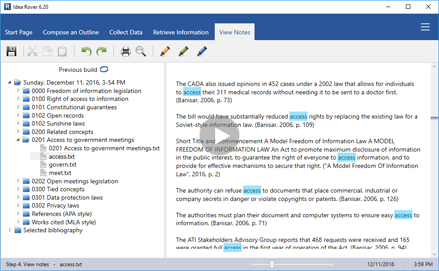 Prepares outline-structured notes and saves your time by eliminating tedious cut-and-paste work. Automates structuring information stored in htm, html, pdf, and txt files (literature review outline template). "Creativity does not bring something out of nothing. It uncovers, selects, reshuffles, combines and synthesizes already existing facts, ideas, faculties and skills." "Even when starting with completely random solutions to seemingly difficult problems, the process of random variation and selection can quickly lead to useful solutions." ›› Idea Rover makes taking notes in other programs incredibly burdensome. ›› Ace Schedule staff employee scheduling software. Give shape to your research papers. Idea Rover 7.10 absorbs and crystallizes your research ideas and new sources into outline-structured notes, releasing your brain from monotonous switching and searching for relevant information. Give shape to your PhD dissertation. Drag-and-drop your files and sources and get a starting place, calmness, and time for writing your essay, project, research paper, term paper, Master's thesis, and Ph.D. dissertation. Thesis writing: How to write an outline, thesis statement, research proposal, literature review, and term papers. Idea Rover is an easy-to-use computer program that allows you to retrieve relevant and outline-structured information: extracting citations, assertions, ideas, concepts for your research papers, literature reviews, essays, projects, Ph.D. dissertation, etc. Measuring your dissertation sources against your outline. Discovering more connections within your dissertation. 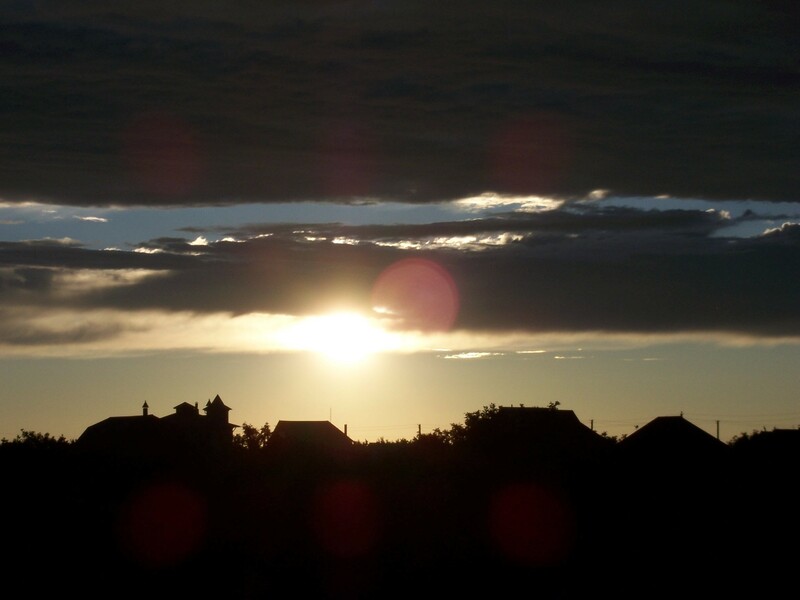 Avoiding plagiarism and getting new tangible results. Automation of structured citation extraction. Facilitating agile lateral thinking and heuristics. Coming up with outside-the-box explanations. Make writing process more 'backboned' and coherent. Save your time for insightful, creative thinking. Locate easiest to write sections and topics. Enjoy 4 easy steps to writing a research paper. Support for APA and MLA citation styles. Integration with Chrome web browser. GNU Emacs 21.3.1 - 'the extensible, customizable, self-documenting, real-time display editor'. 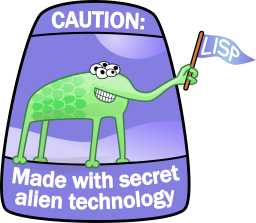 Corman Lisp 3.0 - 'a new standard for dynamic programming languages'. Idea Rover is a note-taking automation tool with a clean interface. 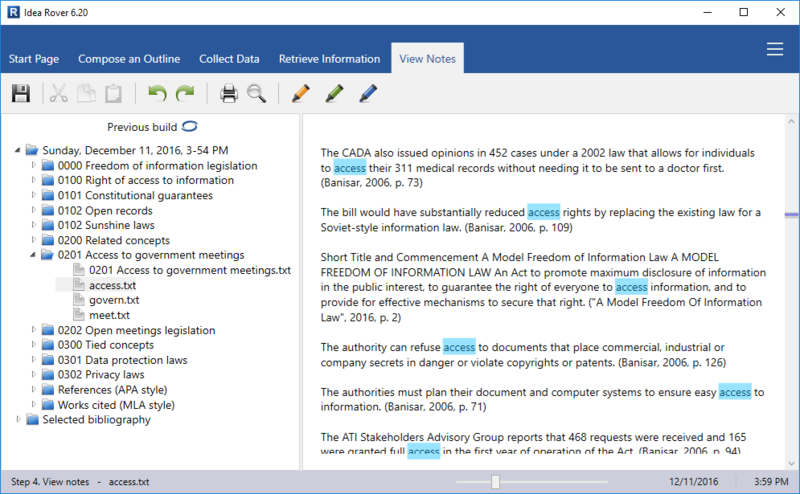 Idea Rover automates organizing your research material into outline-structured notes. Making notes? Distilling your doctoral dissertation research problem? Throw together facts and ideas relevant to your research paper, shape your Ph.D. dissertation with Idea Rover 7.10 now! Purchased one time and there are not continually occurring charges. A new 7.10 version has been released that includes. New plugin for Chrome web browser that helps collect source data. >> Download the latest version.